On Sunday, the Wee Reds Minis travelled through to Prestonpans on a glorious sunny day to play in the Preston Lodge Minis Tournament. Once again, the Wee Reds had a field day, with the P4s and the P7s both winning their respective age group tournaments and the P5s and P6s both finishing excellent runners-up in their’s. 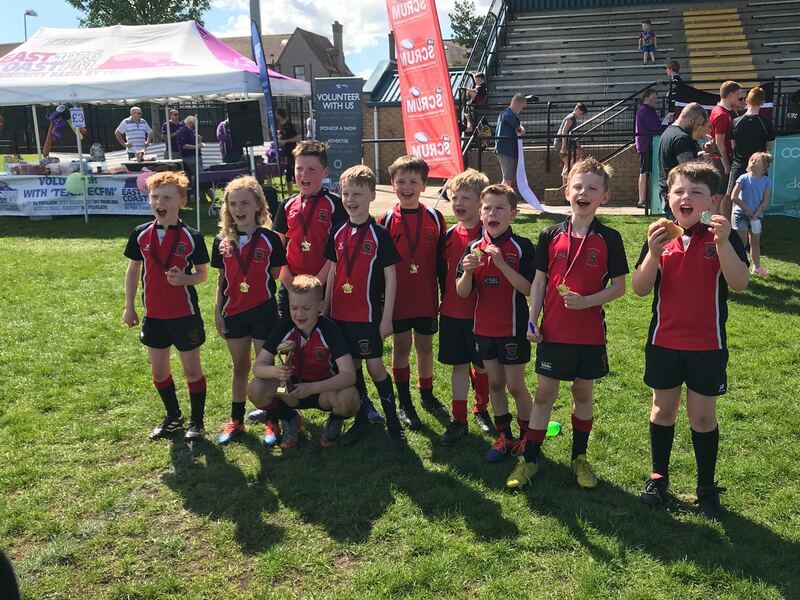 Over the last three weekends, the Wee Reds P7 Minis have won all three tournaments they’ve played in, at Gala, Livingston and Preston Lodge and, ion doing so, have beaten top mini teams from the Borders, the West and the East – a tremendous performance! 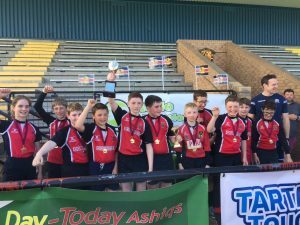 Linlithgow P7s Rugby team makes it 3 tournament wins on a row in the sunshine of Preston Lodge. Good pool wins against Musselburgh and North Berwick with the teams solid tackling and counter rucking giving us lots of ball which the whole team used to score some brilliant tries. This set up a semi final against the hosts Preston Lodge. PL moved the ball around and took their chances well. Again it was the wall of tackling from Linlithgow that secured the ball time and time again and the fast breaks and superb support play had us winning 5 tries to 3. The final was against a strong Portobello side who had some very good players. However, with all 12 of the Linlithgow players giving it everything , Portobello couldn’t live with the pace and power of Wee Reds team across the whole pitch as we won 5 tries to 1. Great day and a great performance from all 12 stars in the team. The Scotland 7s Captain Scott Riddell was on hand to present the cup and medals to the boys and Ailsa. P4s Have Another Great Day in the Sun! On a cracking bank holiday weekend the Wee Reds P4s went to Preston Lodge and emerged victorious! But the story behind the headline is participation. Over the past two weekends the P4s have been to 3 tournaments, taking two squads to Livingston and have won two of the tournaments and come 2nd in the other one. Over that time 22 kids have walked away with a winners or runners up medal (some have more than one medal) which really shows the depth of the squad. Turning to the tournament, arriving at PL in the sun, the backdrop vista of the shores of the Forth was about as ideal as you could ask for. Linlithgow were drawn in a tough pool with some strong clubs and first up it was Boroughmuir. It’s always difficult to get out of the blocks in the first game and despite the high octane warm up, with all aspects of the game scrutinised by the coaches, we were slow to start…particularly in defence. That said the Reds try scoring machine gradually found its rhythm to eventually run out comfortably 6-2ish…Joe, not one you could describe as slow out the blocks took particular delight in pasting his grandads former club! Next up Musselburgh, a much larger outfit than us, partly due clearly to some of the hand me downs sported by some of the opposition. They were very competitive on the floor but gradually Elliot, Rory and Magnus in particular, and usually from an onside position ensured a degree of retention. By the end our extra pace began to tell, Catriona having brought her flying boots, finding room in the corner more than once. In the end the win was comfortable. So to the final pool game – a very well coached North Berwick side who were really moving the ball nicely and not frightened to ruck. It was a tight first few minutes, but gradually our defensive press really started to work, Alex calling the line up well and making some great off-loads. Then came one of the moments of the day for me as Daniel hurtled up the pitch like a bowling ball through skittles before neatly slipping a pass to Thomas to put daylight between the sides. A good win against a good side. Semi final time! Portobello. A little like David and Goliath, wheeled forward a man mountain. Not that Huw noticed – he tackled all day long and some real text book tackles covering back and made sure the big lad never got going. Some great finishing from Joe and Catriona made sure we were in the final! The final was against Dunbar, it looked like we had scored in the first 10 seconds only to be called back for not completing two passes. Then we were behind for the first time in the day. Any chance of a defeat though was quickly dismissed. In particular, Thomas was Herculean in his efforts to turn the ball over and score tries. Magnus came oh so close to his second interception in two weeks. Morgan was desperate to go home with a medal and it was one of his charges up field that lead to the score that clinched it! A fantastic team performance, on a day to make up for all those sub zero conditions you parents have had to weather in the shed! This was one was for the fans! This weekend we were visiting Preston Lodge for their annual tournament. It was a glorious day and was by a long way the best weather we’ve played in all year. In fact, it may well have been the Scottish summer we’ve been waiting for, with the sun shining, not a cloud in the sky and parents applying liberal layers of sun tan lotion to complaining rugby stars…. We had one team travelling today and once again the Linlithgow P6 team acquitted themselves admirably. These were some of the closest fought games we’ve played for a while and the intensity from start to finish was great to see. Sadly we once again ended up as runners up – ever the bridesmaid and never the bride seems the story of the past couple of weeks! We opened up against Dunbar which was to be our only loss of the day and was against the eventual overall winners. They were a physical team and only some heroic defending from Linlithgow kept the score to a single try. Sadly we just couldn’t get going in attack and we couldn’t put together enough possession to equalise the scores, losing by 1 try to nil. Next up were North Berwick, the team that beat us in the final here last year. This was the game when we started to get some momentum and despite threatening play from the opposition we managed to take the lead and never really looked back. The boys grew in confidence and finally started to move the ball around and scored some cracking tries. We ultimately won by 3 tries to 2. Next up were Portobello and we really started to hit our stride. Some fantastic pop passing and strong defending saw us win comfortably by 4 tries to 1. The Portobello coach was extremely complimentary at the end of the game, noting the way the Linlithgow boys managed to keep the ball alive and away from rucks. Our final game of the day was against Musselburgh. Due to injuries in the opposition, the team sizes were reduced to 6 players each, which really opened things up to become a frantic game of rugby. Both teams went at each other from start to finish and some ruthless play from Linlithgow resulted in us scoring 4 tries again and only conceding 1. So a good day all round and it would have been nice to have played Dunbar later in the draw, once the boys had fully woken up. I suspect that we might have given them a fright. 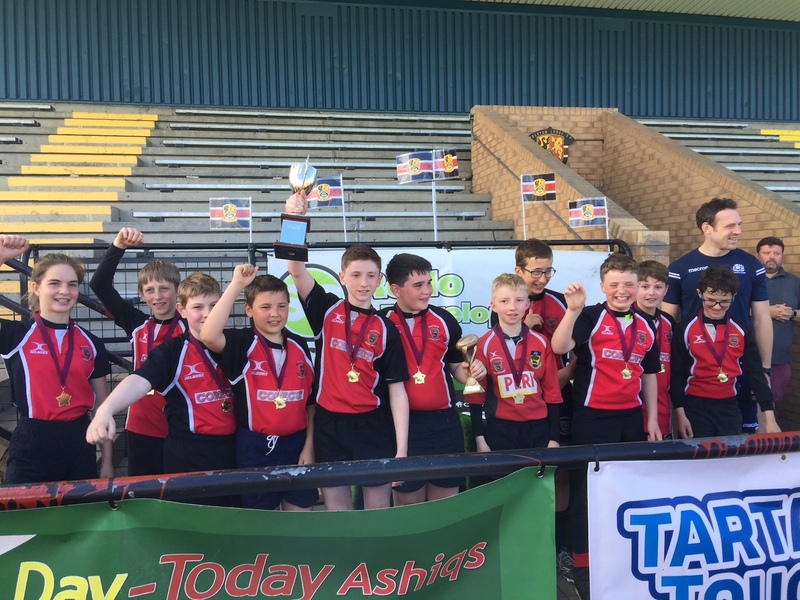 Regardless of that wish though, Dunbar were deserved winners and having played outstanding rugby at times every one of the Linlithgow boys played well and should be chuffed (and hopefully not sun burned) tonight.